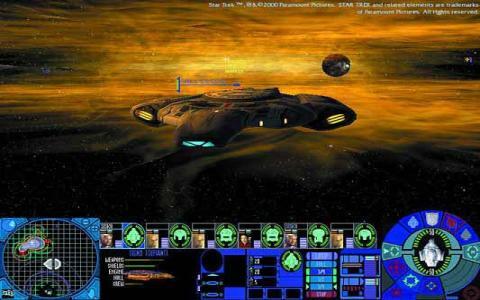 Star Trek has seen almost as many games as Star Wars over the years, from the likes of Armada and Borg, to Visual Star Trek and Generations, some of which are awful, some of which are decent. This one falls into the latter category, as although the concept is sound and most of the execution is fine, it's just short to be a must play. Here, you're presented with the option of controlling the Federation or the Klingon Armada in an ongoing war for the quadrant which is being fought against the Dominion and the Cardassians. 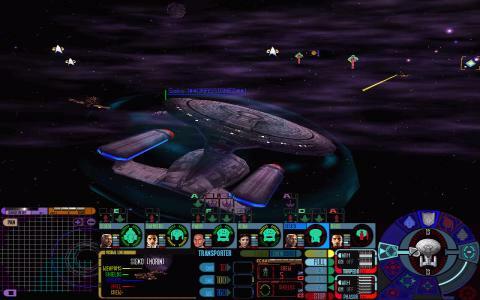 You can choose from one of four races to command, and must build up your crew, weapons and ships as you take on a series of missions spread over several campaigns. The main focus here is on strategic ship-to-ship combat, and you'll issue orders to your fleet, commanding several simultaneously, making this an exercise in juggling and real time management. There's a range of ship options open to you, with different classes, weapons and upgrades to discover and which helps give the game some added interest. For the most part, this is a fine if slightly uninspiring game. It gets off to a good start with an impressive opening sequence, and as it continues, it really nails the DS9 vibe, with some nice visuals and cool ships. There's also appearances by notable characters from the show, which adds to the atmosphere. However, you'll soon find that the game is pretty short, and probably won't take you long to complete, while the AI is only adequate and with the tutorials and certain controls rather lacking. All in all, this is quite a fun addition to the Star Trek universe, but feels a bit like a missed opportunity.